An intense and concentrated version of Outsider may be played as an event in itself, or as a sub-game within the larger game of Outsider, perhaps to begin or to conclude it. I call this variant Fishing, because of the methodical way the gamekeepers cast through the waters and also because there is a creel of sorts. As with many other games, this one lives in its process, which is fairly independent of whatever particular content it is applied to. In the course of a longer campus visit, three of us went Fishing with the political activists of the campus community. In phase I, we organized the expedition. We circulated in the social environment to recognize the various groups of activists, and to identify within each a person or two from its long-term core, of a reflective cast of mind. We sought out similar people in the newspaper, the student government, and the dean’s offices, and two “young Turk” faculty. We asked each personally to come to a meeting, whose function we explained; and if they could not, to choose and motivate a best replacement. Phase II began in a large comfortable room, with a large two-faced blackboard to be the creel. There were some fifty people present, representing essentially all of the campus’ activist factions and splinter thrusts, and including some older activists now living in the town. Altogether, they were as detailed and deep a body of living information about the lived history and present state of campus activism as could be easily assembled in one place. We talked briefly about the purpose of the game – to generate a compact and useful readout of this information – and asked their patience with the way we would try to serve it, in a taut and coldly efficient style; and then began. In phase III, we fished in the waters of the past, to assemble what people knew about the developmental history of the work they were continuing. We drew equal lines across the blackboard to mark off eight years, with the present at the top; and then began to fill in the bottom space with a picture of campus activism in the ebb-year of 1962, the very beginning of New Left activism there, using circles of various sizes for groups and stars for key organizers. As we filled in the chart year by year from the bottom up, we watched the first organizations form, grow, divide, change their names and focus, disappear, diversify. Four broad streams of activism became clearly defined – the strictly political, the social reformist, the educational, and the “life-style” (“hippie”) thrust, less visible organizationally – and phases of development within and between them became literally visible. We watched the diverse flow of activist energy surface in mass rituals of protest and festival; generate various groups, some quite unexpected; wax and swell as the groups fell apart or brought their work to a public maturity; and subside while resurgence was prepared. We watched anti-war energy, frustrated, flow sharply into ecology, and traced with broad arrows the other dynamics of the streams. As this panoramic picture developed, we identified the main outside events and psychosocial influences that affected the flow, and discussed the life-cycles of organizations. As key people’s names were mentioned repeatedly, a webwork of stars and lines grew on the board, within the larger picture, to give focus to what most sharply concerned all present. With this webwork’s aid, we were able to identify and analyze the successive waves of organizers, to outline the main problems they faced and their strategies and styles, to grasp how broadly and long they worked and how their work changed, and to see whether or not they helped train others to carry on and transcend their work. When the pool of information was fished out for the time being, we had on the large board a dense picture of the history of the present movement – a perspective now shared by all present, enabling them to understand their group’s place in the dynamics of the whole; to grasp the present state of the whole as a phase in a cycle; and perhaps to better understand the present instant’s limitations and potentials. Need I say that this took many hours? We began not long after our scheduled start at 10 a.m. on a Saturday. Fortunately, we had brought plentiful cheap lunch supplies, for the participants could not anticipate how long and intense a process they were entering. What kept them there was not our charisma, but the live drama of a collective history unfolding before their eyes, drawn entirely from them, setting into a coherent matrix the fragments of history and development that each knew differently. 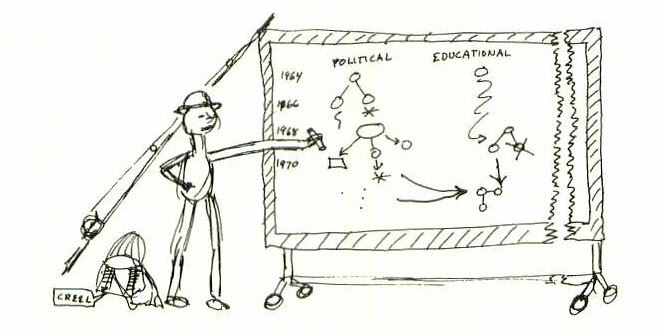 In phase IV, after we came back from dinner, we flipped the blackboard over and began to fish in social space rather than time, to draw a more detailed picture of the present state of organized campus activism. One representative from each group described its size, internal organization and energies, and projects; and its connections and interactions with other groups. As the information came out, the gamekeepers diagrammed it. When the process was done, we had a rough power-structure analysis of the broad, diverse movement, and a picture of its network of contacts and communications. Cooperation and flow, bottlenecks of information and power, isolation and subordination, all were graphically expressed, nestled in the topography of the group landscape. With this, we began to diagnose what agencies of mutual information and action might better contribute to the health of the whole. We sketched them in and speculated about their consequences; but postponed concrete talk about which ones might be organized and how until a later session, for this phase too had taken some hours and we were all tired. In this kind of Open Interview process, the gamekeepers are on top of each testament, probing for its sufficiency, recording it, fishing for the next. To be orderly and comprehensive, they must run the process so tightly that they begin to determine its content, by the kinds of category and relation they fish for. There is no way around this, but to do what one can to make this shaping useful -- and also to call the group’s attention to the gamekeepers’ directive role, and ask for their concurrence in this. The gamekeepers need know nothing of any local particular. They need a good sense of the characteristic patterns they are fishing for; the wit to recognize what is unusual; and skill at helping people share their own understandings of these matters in concrete ways. In some ways, Fishing feels like an inquisition; but it is an inquisition which people agree to and aid, for mutual benefit. More deeply, it is an act of art, of collective magic. For I have described two ways in which the gestalt of a complex working system may be portrayed: in developmental history or in present structural dynamic. In portraying itself literally, graphically, on the boards through the gamekeepers’ hands, the group engaged in a deep kind of conjuration which I’ll talk about more directly in the game Portrait and Dance. Here it is best to speak in terms of the wholeness of the social process. These people, representing a larger collectivity, represented it on the board, assembling not only a summary of scattered information beyond the power of any single person or group to know, but also an image of the whole, which focused its reality in the imagination. In the conversation of any Open Circle process a gestalt of perception grows; but to represent it tangibly is an additional step, endowing it with formality and objectivity, and conjuring its spirit. In this case, this meant the difference between having a sense that there was a whole, and grasping what the whole was; and the pictures became the symbols of a new and larger frame of action. When only a relatively-few representatives of the whole participate in this game of portraying it, there needs be some way of feeding the images back to everyone. In this case we simply involved the people most apt to be the bearers of this sort of perception within their own groups, deepened their perceptions, and left them to their own ways of bringing the images home, perhaps by verbal report or by recapitulating the fishing process within their own groups. More formal and systematic ways of sharing these rich collective images can be designed.